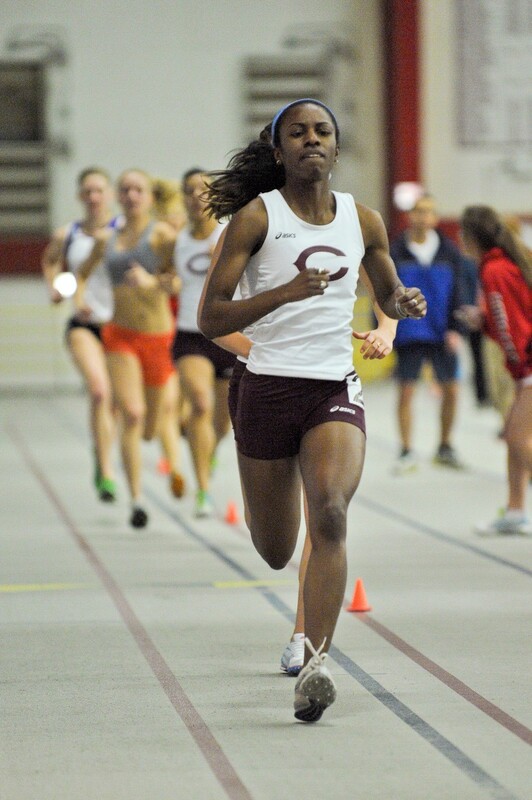 Following their performance in the Last Chance Meet, the women’s distance medley relay team of second-year Michaela Whitelaw, fourth-year Jaleesa Akuoko, third-year Kayla McDonald, and third-year Julia Sizek will travel to Grinnell, Iowa this Friday for the Division III Indoor National Championship. With a time of 11:59.64 at North Central this past weekend, the team has claimed the 10th and final qualifying spot in this weekend’s race, which consists of 1,200–, 400–, 800–, and 1,600-meter legs. The relay’s time is less than a second behind ninth-seeded St. Thomas (Minn.), a little more than five seconds behind eighth-seeded Amherst, and more than 20 seconds behind top-seeded Middlebury. McDonald also qualified for the 800-meter run, but has decided to forego the event. Since the 800-meter prelims take place immediately before the DMR, she wouldn’t have had enough time to recover for the relay. The top eight teams in Friday’s relay will be named All-Americans, and that is the target. “Our goals are going to be to be All-Americans this weekend. The DMRs are so hard to get into—they really are. I feel like you’ve already been through the preliminary rounds,” Hall said. “I think it’s very realistic for us to be in the top eight; I think if we run the way we did this past weekend we’ll be an All-American team. You can’t count on a win. Barring a disaster or a miracle, it’s not going to happen. But that doesn’t mean, say, a fifth-place performance is out of the question. Eighth place isn’t the limit of their ambition, but it is the finish that will, in a sense, define success or failure. The women’s DMR starts at 7:20 p.m. on the track of the Charles Benson Bear ’30 Recreation and Athletic Center. For the women, it’s time to become All-Americans, or to return to Chicago with nothing but the experience.